I’m pleased to announce that bookings are now open for IWMW 2015, the 19th in the series of annual Institutional Web Management Workshops, which provide development opportunities for those with responsibilities for the provision of institutional web sites or development and implementation of digital strategies in the UK’s higher/further education sector. As is the norm the IWMW 2015 event will last for 3 days, starting after lunch on Monday 27 July and finishing before lunch on Wednesday 29 July. The event consists on a number of plenary talks together with interactive workshop sessions, which provide an opportunities for participants to actively engage in discussions of areas of interest. Putting The Web Manager First: The opening session provides an opportunity to hear from two institutions about how institutional web and digital teams are responding to the challenges we are all facing. Supporting Our Users: Two plenary talks will explore how institutions are responding to their customer needs in the context of new operating realities and the importance of providing outstanding user experience as a key differentiator for an increasingly demanding student environment. Managing the Content; Developing the Services: Two plenary talks will explore approaches to managing content and developing services. Beyond the Institution: In light of the importance of use of third party services for supporting institutional services there will be two talks from organisations who can support institutional activities: Jisc and LinkedIn. Embed Yourself in an Institutional Web Team: Managers of two institutional web teams (based at Liverpool John Moores University and Bradford University) will facilitate sessions which will provide opportunities to learn how other web teams address challenges they are facing. Agile Working: Managers of two institutional web teams (based at the universities of Edinburgh and Bath) explore approaches to agile working for content creation, delivery and standards and usability testing. Perspectives from Beyond the Sector: Staff from three commercial companies which work closely with the higher education community with Lessons facilitate master classes on Lessons Learned from Helping HE Institutions Develop their Digital Strategies, Exploring the Use of CMSs across Higher Education and Radical Simplification. The cost of the IWMW 2015 event is £390 which covers two nights’ accommodation, workshop materials, lunch on the second day, the conference dinner and a wine reception. For those who do not require accommodation the price is £300. Note due to the limited size of the main lecture theatre we will not be able to host as many participants as recent years. In addition there are limits to the numbers of participants in the workshop sessions and master classes. We therefore recommend early booking! 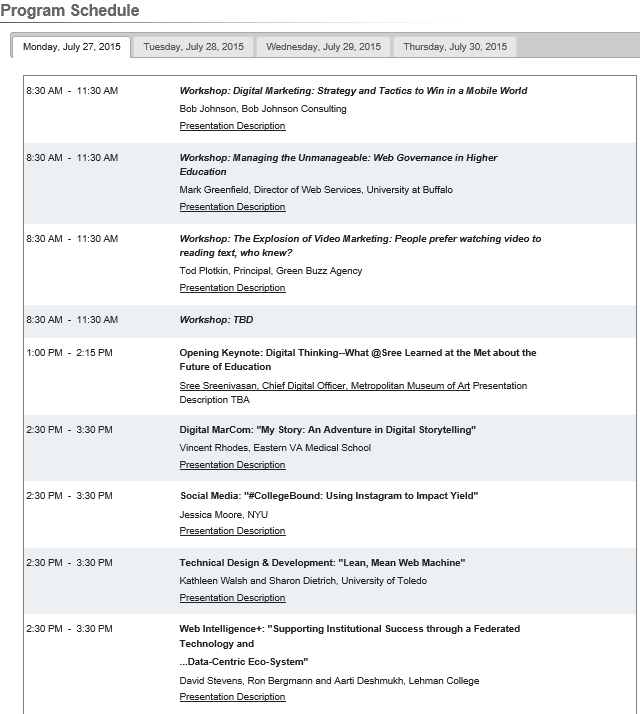 A recent post on Revisiting Ideas for IWMW 2015 explored some ideas for possible sessions at this year’s IWMW 2015 event which has the theme “Beyond Digital: Transforming the Institution”. IWMW, the annual Institutional Web Management Workshop, has, since its launch in 1997, provided a forum for learning about new web developments, sharing experiences, developing one’s professional networks and, last but not least, having some fun! It is valuable to be able to learn from one’s peers and the institutional case studies which have been presented at IWMW events have provided an opportunity to learn from others in the sector who are typically facing similar challenges. 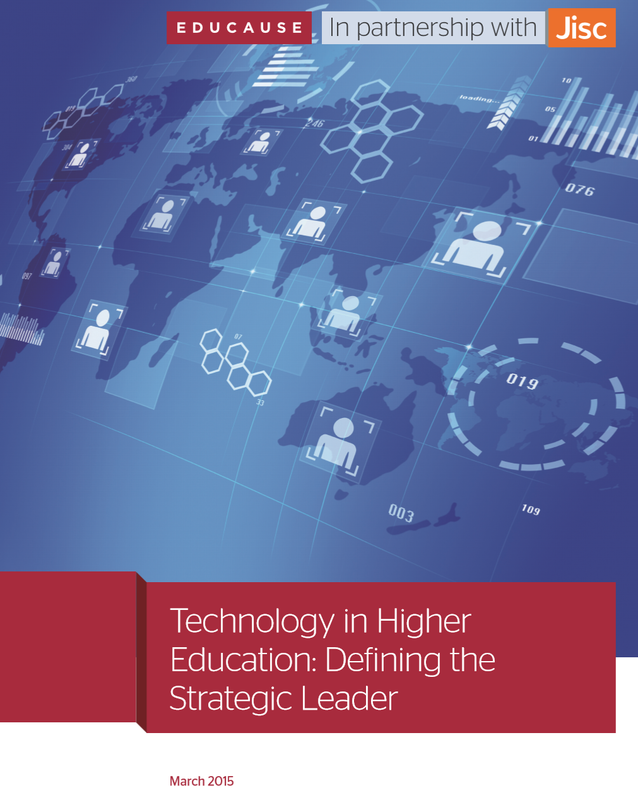 However it can also be useful to explore the approaches which are being taken beyond the UK higher education sector in order to learn from others and avoid the risks associated with the echo chamber and confirmation biases of seeking support for one’s preferred approaches to providing institutional web services, for ‘thinking digital’ and, moving to the next steps in ‘transforming the institution’. Back in February 2009 I asked What Can We Learn From The eduWeb Conference? It’s timely, I feel, to revisit that question but with a broader focus. The question for me, therefore, is “What Can IWMW Learn From Higher Education Web Events in the US?”. HighEdWeb’s involvement in organising events for web professions in higher education dates back to 2004when the organisation “joined forces with WebDevShare to create an annual international conference where the community can come together to learn, share and network. The Association also runs a series of smaller, targeted regional conferences around the United States“. created by and for higher education Web professionals. This not-for-profit conference offers high-quality presentations, speakers and events at affordable rates. From Web developers, marketers and programmers to managers, designers, writers and all team members in-between, HighEdWeb provides valuable professional development experience for all those who want to explore the unique Web issues facing colleges and universities. 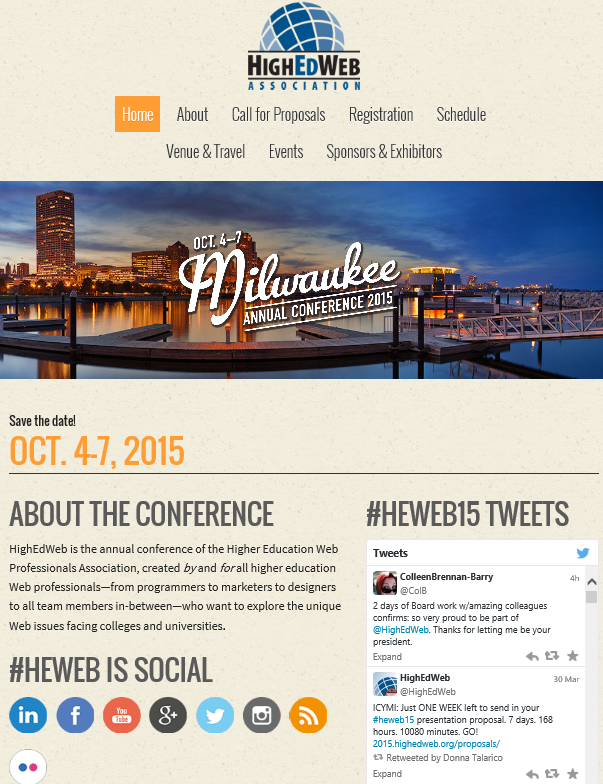 The year’s conference will be held on 4-7 October in Milwaukee at the Hilton Milwaukee Downtown. The call for proposals is currently open with three types of sessions available: (1) 45-Minute conference presentation; (2) poster presentation and (3) 3.5 hour workshop session. The conference rates are HighEdWeb member rate: $725 (£490) and non-member rate: $825 (£558) for earl registration with the full conference rates being $850 (£575) member rate and $950 (£642) non-member rate. In addition the workshops cost an additional $160 (£108) for one workshop or $220 (£149) for two workshops. It should be noted that these rates do not include accommodation, which costs from $177 (£119) per night. Wednesday, 7 October: track sessions; closing keynote and post-conference workshops. The main differences with IWMW events are the Sunday start; the poster sessions and the post-conference workshops. Both events provide an evening for delegates to make their own choices for dinner and a social event although IWMW events also provide a conference dinner. Looking at the timetables for HighEdWeb 2010 (held in Cincinnati), HighEdWeb 2011 (held in Austin, Texas), HighEdWeb 2012 (held in Milwaukee), HighEdWeb 2013 (held in Buffalo) and HighEdWeb 2014 (held in Portland, Oregon) have all had a similar structure although last year’s event began with the first part leadership academy on the Saturday which also ran from 8am to 4pm on the Sunday! The HighEdWeb 2014 conference began with four half-day workshop sessions which were held on the Sunday afternoon: Developing and Maintaining Web Content: An Idea Generating Workshop; Video Production Workshop; Get on Track with Content Strategy and Is my .edu accessible?. Over the remaining 2.5 days of the conference the sessions were split into a number of parallel sessions including Applications, Integration and Mobile; Development, Programming and Architecture; Marketing, Content and Social Strategy; Management and Professional Development; Technology in Education and Sponsors sessions, as illustrated. After a concluding plenary session and lunch the conference finished with the second set of workshop sessions on Finding Your Way: Fixing (Conflicting) Map Data and Building an Interactive Campus Map; Navigating Social Media in Higher Education; A Nuts-and-Bolts Introduction to Client-side Interactivity with jQuery and AJAX; Responsive web design and Let’s face it: We’re not sixteen anymore. an annual, internationally recognized event for the higher education community, attracting those who are involved in the design, development, marketing, strategy and implementation of their online presence. This year’s event will be held at the Westin Downtown hotel, Chicago on 27-30 July. The event features four tracks including: digital marketing; web development and web strategy. The programme for this year’s event is available. As can be seen from the screen shot of the timetable for the opening day the event mainly consists of plenary talks which, unlike the HighEdWeb conference, are not split into parallel streams. The third and final day of the conference does provide four sessions entitled Breakfast with the Best which take place before the closing plenary talk. After the lunch break there is a half-day workshop on “Closing the Loop: Gathering and Using the Right Data to …… Evaluate Your Marketing Initiatives“. The day after the conference features a full-day master class entitled “How to Use Market Research to Capture the Essence of Your Institution“. 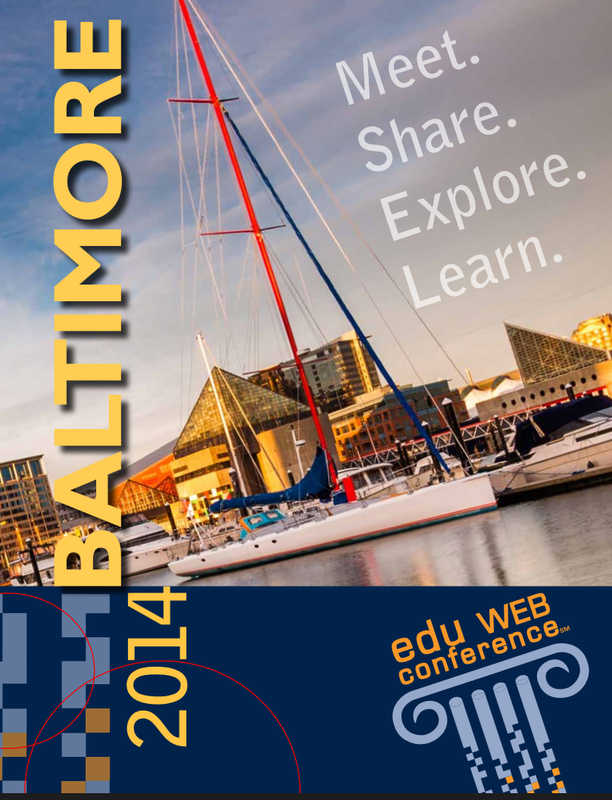 It should also be noted that the programme for the EduWeb 2012 (held in Boston), Eduweb 2013 (held in Boston) and EduWeb 2014 (held in Baltimore) events are available (links are to PDF files). Platinum Package (pre- and post-workshop sessions, master class and full conference): $1,305 (£882). It should be noted that these rates do not cover accommodation, which costs $229 + tax (£155) per night. The first thing which struck me was how affordable IWMW events are in comparison with the HE Web and EduWeb conferences. As described in a post about IWMW 2014 the IWMW 2014 event cost £350 which included 2 nights’ accommodation – and this has been the maximum price over the past 5 years. The following table summarises the typical costs for the events (where early bird rates are available these are shown). IWMW £350 2.5 days Conference, workshops, breakfasts, lunches, conference dinner, social event and 2 nights accommodation Student accommodation provided. HE Web £490 2.5 days Conference, breakfasts, lunches, conference dinner, social event and social event but no accommodation Additional £108 for one or £149 for two half-day workshops. Accommodation from $119 +tax per night. EduWeb £537 2.5 days Conference, breakfasts and social events but no accommodation Additional £132 and/or £402 for half-day workshops / full day master class. Accommodation from $155 + tax per night. 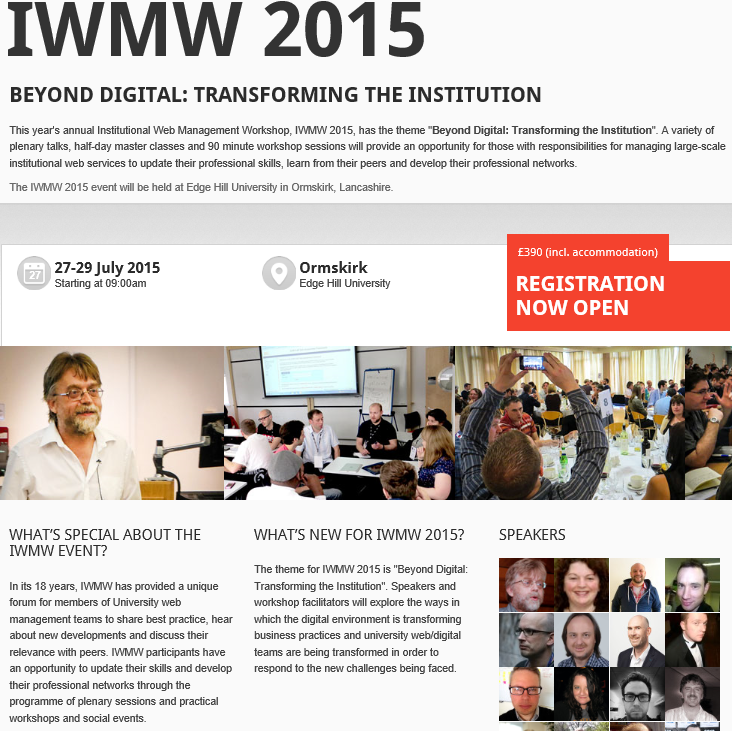 The low costs of the IWMW event reflects its origin as a JISC-funded event delivered by UKOLN. However the need for the event to now cover its costs may necessitate increases in the charges to attendees – a possibility which was acknowledged in discussions at least year’s event. For several years the IWMW event has accepted sponsorship. However in order to avoid possible conflicts of interest with JISC we ensured that the sponsorship was used to cover the costs of social events and conference ‘schwag‘ such as rucksacks, badges, etc. Looking at the list of sponsors for the HighEdWeb 2014 (illustrated) and EduWeb 2015 conferences it would appear that organisers for these events have been pro-active in attracting sponsorship. The list of sponsorship opportunities for EduWeb 2015 provides details of the range of sponsorship opportunities available at this year’s EduWeb conference, which range from $1,500 (£1,012) for sponsoring tracks at the event, the opening and closing keynote and the lunch session with other rates available for sponsors’ branding at meals and coffee breaks, for the event WiFi and for advertisements or inserts in the conference programme. HighEdweb strives to advance web professionals, technologies and standards in higher education. HighEdweb is an organization of professionals working to advance the web at institutions of higher education. We design, develop, manage and map the futures of higher education digital communications and services. Being Trustworthy: We do the right thing; we keep our commitments; we strive for excellence. Being Openness: We strive for transparency in our actions; we value open access to knowledge and resources; We support tools and approaches that cultivate free exchange, participation and community building. Fostering Collaboration: We encourage sharing and teamwork; we support our members’ success and needs; we foster a culture of service within the organization; we provide opportunities to share knowledge and ideas. Is there a need, I wonder, for IWMW to transform from being a well-established annual event for Web professionals to forming the core of a professional association for those involved in providing Web services in higher education in the UK’s higher education sector? Perhaps this is a topic which should be addressed at IWMW 2015. 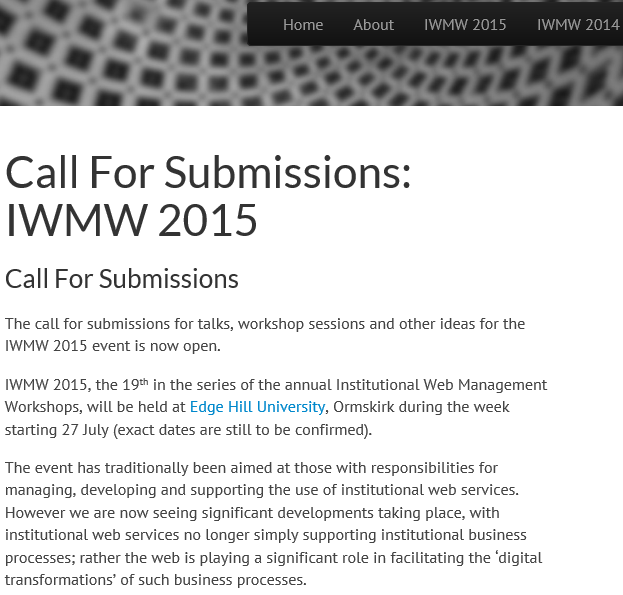 As described in a recent post the call for submissions for IWMW 2015. I hope the links to the programmes for the HE Web and EduWeb conferences may provide some additional ideas for those considering submitting proposals. The Explosion of Video Marketing: People prefer watching video to reading text, who knew? Returning to the question I posed earlier: “What Can IWMW Learn From Higher Education Web Events in the US?” I feel looking at the business and governance models provided for events aimed at Web professionals in higher education as well as the content of similar professional development events held in the US is helpful in exploring options for IWMW, both in the immediate future (IWMW 2015) and beyond. I also feel that we should explore the longer term issues of the sustainability of the Web management community in UK higher education institutions during IWMW 2015. But there is no reason why the discussions shouldn’t begin today – so feel free to give your thoughts as a comment to this post. A recent post on this blog announced the Call For Submissions for IWMW 2015. The post suggested that the theme for this year’s annual Institutional Web Management Workshop should be along the lines of “Thinking Digital”. Subsequent discussions with members of the IWMW 2015 advisory group (Ross Ferguson, Mike McConnell, Alison Kerwin, Clare Gibbons and Mike Nolan, the local organiser at Edge Hill University) led to a subsequent refinement of this idea. It was suggested that the challenge we now face is how we break out of a purely operational role and play a sustained, strategic role at the core of the University business. It was agreed that the theme “Beyond Digital: Transforming the Institution” summarises this challenge nicely. Campaign for a seat at the top table: Clearly demonstrate how IT touches and provides value to many aspects of the institution. Executive peers often have an incomplete understanding of IT and technological issues, and the IT leader needs to paint a compelling picture of the value IT does and can bring. Speak their language: A perception often still exists at the board level that IT leaders are technologists alone, and there is an unease with the language of technology. Don’t start talking about the technology. Start by talking about the business value. Coach executive-level staff: No matter how well an IT leader mentors IT staff, if IT leaders aren’t coaching campus leaders outside IT, they will face significant barriers to success. Build credibility: Deliver on the promises you make, and colleagues will trust you. ‘Talk the talk and walk the walk’. Such observations would also appear to be very relevant for those with responsibilities for managing an institution’s digital presence, so I would hope that the report will help to identify possible areas which could be addressed at the IWMW 2015 event. 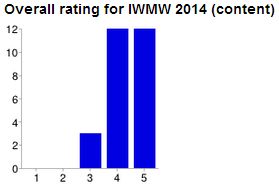 The call for submissions for IWMW 2015 is open. I hope the two reports I have mentioned will help to stimulate ideas for talks and workshop sessions for the IWMW 2015 event, which will be held at Edge Hill University during the week beginning 27 July. If you would like to discuss a possible proposal feel free to get in touch. A year ago, in a post entitled “Call For Submissions for IWMW 2014” I reviewed the history of IWMW, the Institutional Web Management Workshop series which was launched in 1997 and, from 1997 to 2013, provided the main annual event organised by UKOLN in its role as a national JISC-funded Innovation Support Centre. I’m pleased to announced that the IWMW event will continue! The IWMW 2014 event will be held at the University of Northumbria on 16-18 July. The IWMW 2014 event was a great success: details of the programme were announced on 14 April 2014, with a report and a summary of the feedback provided in the evaluation forms was published in August 2014. In addition to the valuable comments which were made the feedback for the overall rating of the content of the event and the organisation was particularly impressive. As shown in the accompanying graphs on a scale of 1 (very poor) to 5 (excellent) the majority of respondents felt that the content was either excellent or very good, with an overall rating of 4.3 and 75% of the respondents gave a rating of excellent for the organisation of the event (the overall rating was 4.7). 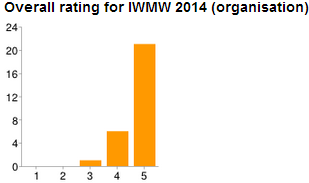 In light of the strong support for the IWMW 2015 I am pleased to announce that call for submissions for IWMW 2015 is now open. Submissions for plenary talks (lasting for 45 minutes) and workshop sessions (lasting for 90 minutes) are invited. In addition we also welcome proposals for other approaches for engaging with the participants which might include panel sessions, debates or masterclasses (lasting for 3 hours). Although IWMW events have also provided a forum for those who work in institutional web management teams to share their experiences with their peers we have also found that speakers from the commercial sector have proved useful so we also welcome submissions from the commercial sector. Submissions can be made using the online submission form. If you would like to discuss possible proposals feel free to send an email to ukwebfocus@gmail.com. At last year’s event the most highly rated plenary speaker was Ross Ferguson, Head of Digital at the University of Bath; 78% thought his talk on “Using the start-up playbook to reboot a big university website ” was Excellent and 22% felt it was Very Good. In light of this talk and subsequent discussions we feel that ‘Thinking Digital’ might be an appropriate theme for this year’s event. However we welcome suggestions for other variants on this theme. As ever comments on this blog posts are welcomed.